December First—Jim proposed, and Melissa accepted. With just twenty-five days to make it happen, is it possible to create the perfect Christmas Wedding? Jim Standish is ready—right this minute—to marry the love of his life, with a quick trip to the courthouse. But Melissa Singer wants the event to be beautiful, romantic, and memorable. And on Christmas Day! Everyone in the Standish family is doing their best to help. But they’re also busy with the holiday season on the Standish Family Christmas Tree Farm. An unwelcome reminder of the past appears, the dress designer is working overtime, and nothing seems to go right. They just have 25 days to make this event happen. Is it possible to create the perfect Christmas Wedding? Christmas Wedding is a wholesome, heartwarming small town romance that will make you believe in second chances – and in Christmas magic. I tore my gaze from the beautiful snow-covered Christmas trees all around us and looked at Jim. He winked then turned his attention back to his driving. Had I missed something while in my reverie about work? My real estate office was doing well, but there was always something that needed my attention—and I wasn’t doing any extras for work this month because of helping out in the evenings at the Standish Christmas Tree Farm. I glanced at my six-year-old, Matthew, sitting between us on the truck’s bench seat, but he didn’t seem aware of whatever topic I had missed out on. He was mesmerized by the snow flurries we were driving into as the pickup made its way down the driveway and onto Tree Farm Road. “Mr. Jim, the man has to be on the floor,” Matthew told him then looked at me and smiled. “Right, Mommy?” It took me a moment to realize he was referring to seeing a man down on one knee to propose marriage. “And what a package it is.” Jim smiled and shook his head. “Very nice indeed,” he said softly. My face grew warm as I anticipated our goodnight kiss—a few stolen moments of togetherness. When we turned onto North Main Street and my house came into sight, I sighed happily as I had done each time I approached it since moving here. If it hadn’t been for the old Osborne place going up for sale, I might not have moved back to Serendipity after twenty years away. The big solid house had always inspired a feeling of strength and security in me when, as a kid, I had ridden past it on my bike. Later, on the night of our senior prom, the house had taken on a new importance in my life. A couple of years ago when I lost my real estate job in Fort Wayne, Indiana, I decided to buy a real estate business in Serendipity from a couple who were retiring. It had been an upheaval, especially for Matthew, for us to move two hundred miles south to the hilly, southern part of our state and my little hometown where I hoped I could give him a similar childhood to my own. Similar in location at least—but vastly better in other ways. I had hired a teenager to help me string white lights all along the front of the house, outlining the shape of the big square home and also highlighting the deep front porch. The evergreen bushes by the porch wore nets of white lights. I had restrained myself from doing more, though it had been tempting. I know the kid was relieved to see the last box of lights emptied and also glad that we’d lucked onto a warmish day in late November to get the job done. The exterior lights turned on and off with the porch light, thanks to a helpful neighbor’s ability with wiring. Tonight—December 1—was the first day I had switched them on, and I had been eager to do it as soon as I closed my office for the day. Jim looked at me, and I nodded. I was surprised to feel nervous about it. Key in hand, I headed to the side door, the way I always entered from the driveway, but Jim took my hand and tugged me gently toward the front porch. “C’mon, Mel. We’d just as well do this in full view of the folks of Serendipity.” Matthew changed direction and trotted along beside us, adjusting his knit toboggan cap that Jim’s mom had made him for Christmas last year. “Well, we need to make this work for us, Matthew. Hmm. I think you should stand next to your mom.” Matthew climbed the two steps and stood next to me, and I took his hand. Jim knelt on the sidewalk at the foot of the steps and looked up at us. “Okay. Sure, Mr. Jim!” He ran down the steps and into Jim’s arms, nearly knocking him down. We laughed together as Jim stood and swept Matthew up into an embrace and gave him a noisy kiss on the cheek. 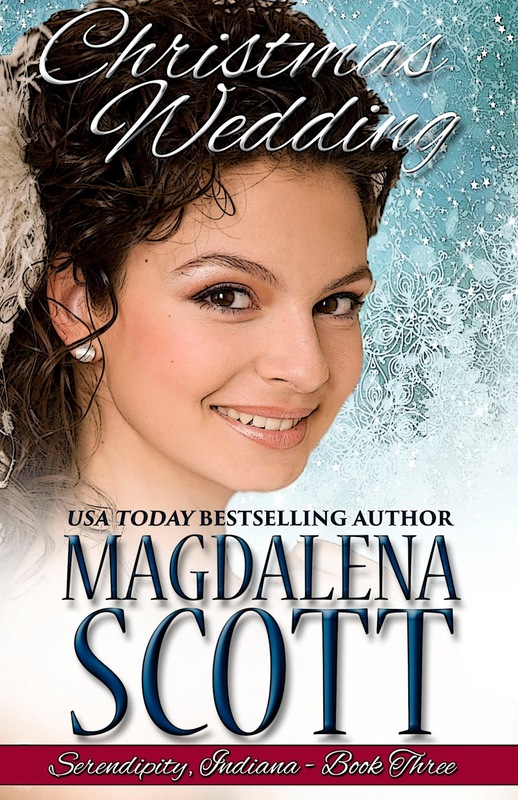 Fluffy snowflakes landed on their shoulders, and I floated down the steps to my family. I stood on tiptoe, one hand on Jim’s arm and one on Matthew’s back, and met Jim’s lips for a tender kiss. There was hope in it, heartfelt promises, and at the edges, the passion we wouldn’t be acting upon tonight. Matthew and I went upstairs. After he brushed his teeth and put on his flannel pjs, we spent a few minutes choosing books to read before I turned out the lights. I leaned back in the rocker, admiring the brightly decorated walls that I had redone with the help of Jim’s sisters, Carla and Francie, and our friend Alice. Trucks of every color and description traversed the walls. The girls and I had painted this room shortly after Matthew and I moved in—one of the few changes needed to make the beautiful home ours. But now what? Would Jim live here with us or would we all live in his much smaller cabin on the tree farm? If we moved, where would my real estate office be located? I loved having it in the large room downstairs with a view of Main Street. I stepped into Carla’s shop, Creations, announced by the bell above the door. She emerged through the purple velvet curtains that led to the workroom. “Wedding,” I whispered, though it would have been fun to shout. “What? That cheapskate. After the big rock David gave Emily, you’d think he would have some idea what’s expected. And back in the day, the ring Jim gave Diana was—” She clapped a hand over her mouth. She stared at me, goggling. Her mouth moved but no sound came out. That evening, Jim and I held hands as we walked into the Christmas shop. Matthew followed behind silently, afraid he would blurt out the news to Lillian that he’d been telling his friends at school all day. As the mom of two of my best friends when I was a kid, Lillian had been a surrogate mother to me. What Jim and I had been through hadn’t been easy for her, I knew. “Do you think it’s crazy to get married on Christmas Day?” I asked, looking around as more customers entered the shop. Find CHRISTMAS WEDDING at your favorite online retailer. 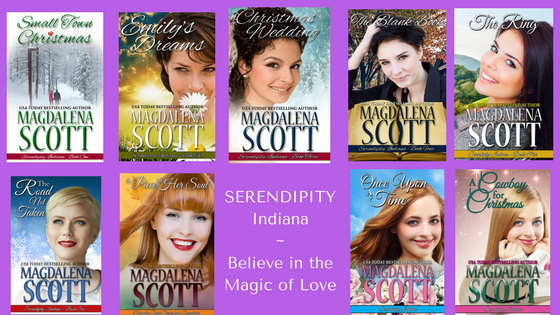 Learn more about the rest of the Serendipity series on my Serendipity page, here.